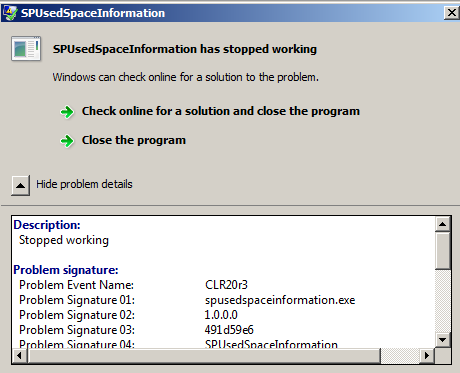 I was trying to run SharePoint Used Information Space on my development environment and every time I ran the application it crashes on Windows 2008 SP2 server. Part of troubleshooting was to uncheck the box "Use User Account Control (UAC) to help protect your computer"
Note: reboot is required in order for changes to take affect. After the reboot, I was able to run the application. 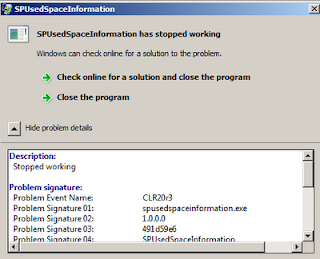 This issue affect other applications, I remember we had to do the same thing for a backup software. So, if you UAC is enabled on Windows 2008 and you have an issue running the application, the first thing is to tun off UAC feature.